Lubrication is the process of reducing friction. Friction, unchecked, causes wear, wastage of energy and rising temperatures that can cause great damage to machines and equipment, but it will never be completely eliminated. The single important criteria of lubrication is the maximum reduction of friction. Lubrication is the key to reducing energy wastage and parts deterioration. Wear reduction can become the key to maintaining mechanical equipment at their optimum efficiency and to extending machine life. Lubricants can be either gas, liquid, solid or synthetic. They are important in keeping contaminants from delicate machinery parts in environmentally-polluted areas. Heat build-up is a major problem area for maintenance engineers as machines work longer and faster without stoppage. Special additives are increasingly important to help reduce generated heat which would otherwise cause the machine to break down. Lower production costs which result from uninterrupted machine operation, lower maintenance costs and less need to replace parts. To maintain efficient and continuous performance of plants, factories and workshops, it is essential to set up 'corrective' and 'preventive' maintenance systems. Corrective maintenance is when slight damage to equipment or machinery occurs. It encompasses the repair of the part and is generally the policy in smaller industries which have a small number of machines and any damage would not normally affect the flow of production. Preventive maintenance is directed towards getting the longest period of machine performance without problems or damage which would cause a disruption of production flow. With effective preventive maintenance, it is possible to maintain maximum efficiency in industrial production with minimum time loss caused by interruptions. This makes it possible to obtain the lowest cost for the final product. Preventive lubrication is perhaps the most important aspect of preventive maintenance: From statistics collected over many years, Omega researchers have calculated that general maintenance costs about 5-10% of the total operational cost and the maintenance lubrication costs only 2.5% of the general maintenance cost. In other words, the cost of maintenance lubrication when compared with the total cost of production, comes to between 0.125-0.25%. Analysis by Omega Manufacturing Division of maintenance lubrication needs show that this is the main support of general preventive maintenance program and that inadequate lubrication will cost disproportionately more than the money foolishly saved by using low-quality lubricants. Modern machinery is complicated, compact and requires precise adjustments in operating conditions that are severe and varied. This has resulted in a great number of different types of lubricants being used, but it takes a great deal of attention and effort to ensure proper application. Cost saving - the possible savings by Omega lubricants are about 100 times the cost of lubrication. Performance observation - Better quality Omega Lubricants last longer even working at maximum speeds and generally, lesser quantities are required to do the job than with a less expensive lubricant. Maintenance costs - High quality Omega Lubricants result in less replacement parts and less damage to machinery. Minimum breakdown - Breakdown is not only expensive to repair but also very costly in terms of production failure. This is true not only in highly-automated factories, even a small farm that has a tractor down can lose a lot of money. Lubrication with Omega cuts down the number of breakdowns dramatically. Less production rejection - Many products are rejected when undergoing inspection. Many rejected products are the direct result of the machinery not performing according to plan because of wear due to inadequate lubrication. Bearing and gears in processing plants make up 90 percent of lubrication requirements. Bearings can further be subdivided into plain bearings and anti-friction bearings. Gears, correspondingly are also of different varieties - spur, single-helical, herring-bone bevel worm or hypoid. Each of the different types of bearings and gears perform in different ways and require individual lubrication qualities - or do they? After carefully examining the performance of each of the above-mentioned bearings and gears, a minimum list of suitable lubricants can usually be worked out. The surface-to-surface contact characteristic of each class of bearings and gears provides a means for drawing up such a list. Consisting of two surfaces slipping against each other, plain bearings are normally lubricated by oil chosen to accommodate either journal speed or loading on the bearings. Higher viscosity oils are usually required for once-through lubrication with small volumes of oil, start up lubrication and lubrication for heavy loads. And, if temperatures are at about the ambient-level, the selection of lubricating oil would be affected accordingly. Lubricating grease should be used with plain bearings when: speed is slow, loads are heavy and temperatures are high; operation is intermittent and clearances are large; locations are inaccessible; they are easily contaminated with water or dirt. It should be recognised that the oil viscosity and the oil's non-corrosive additives are very important to the life of plain bearings. These bearings include ball, straight-roller, tapered-roller, ball-thrust and needle-roller elements. They use oil which is selected according to the inside diameter of the bearing, journal speed and temperature. Grease lubrication, however, offers wide design versatility, because a single high-performance Omega grease may be used to handle all diameters of bearings, and all temperatures from -29oC to 140oC. A high quality grease, Omega 77, provides dramatically reduced inventories, downtime and maintenance costs. Optimum bearing life can be achieved by maintaining a clean lubricant in a clean bearing. Bearing design variations can increase the resistance to thrust, extremes of temperature, pressure and exposure to corrosive fluids. These gears have teeth that cut straight across the face of the gear blank providing gear-to-gear contact parallel to the shafts. The consequent sliding and rolling in and out between the teeth builds up a substantial oil film. Spur gears, therefore, can be lubricated with an uninhibited and less expensive oil. Omega 670 gives more flexibility than ordinary mineral oil. These gears have shaft centerlines which are parallel to each other with gear teeth cut diagonally across the face of the blank. This type of gear enables longer tooth contact time as well as allow more than one set of teeth to be meshed at one time. These gears can cause considerable sideways thrust. They can usually be lubricated with the same type of oil as used with spur gears - Omega 670 - but, depending on the usage, may sometimes require extreme-pressure (EP) additives - Omega 690. The V-shaped gear-tooth is the characteristic of herring-bone gears. These gears produce counter-balanced sideways thrust. Only a radial sliding and in-and-out contact between the two parts of the herring-bone gears are experienced. In this case, Omega 670 should be used. Bevel gears have intersecting shaft centerlines and usually have teeth resembling that of spur and herring-bone gears. These bevel gears can be lubricated with Omega 670. These are used usually when shaft centerlines are at right angles to each other. Worm gears include a smaller driving member (a worm) and a larger driven member (the gear) with the worm meshing on the outer edges of the gear. Such a gear arrangement can accomplish large reductions in driven output rpm, with the resultant increases in applied torque. There is a great deal of sliding near the line of contact between the teeth which interferes with the formation of a substantial film of oil. For worm gears, therefore, Omega 680, with its limited slip differential performance, is the best lubricant. Similar to a worm gear but the worm meshes on the side of the gear. This gear also tends to wipe away the protecting film of oil making lubrication difficult. It is essential that hypoid gears should be lubricated with Omega 690 gear oil suitable for severe loading. Omega Manufacturing Division has developed and formulated special high-performance greases that provide "extra duty" lubrication under a wide variety of difficult operating conditions. These Omega multipurpose lubricants are engineered to outperform ordinary lubricating greases. Reduced breakdown or production loss time. Because fewer greases are needed, fewer have to be bought and stocked. Buying larger quantities of fewer products bring cost savings in reduced per unit costs. Application by untrained or semi-skilled personnel is possible and fewer chances of misapplication are encountered. Standardization on high quality, extended performance Omega multipurpose greases allows for the implementation of automatic grease dispensers or greatly simplified application procedures using lower cost personnel. Maintenance costs are reduced as parts last longer and run better and the Omega lubricant is less prone to squeeze out, burn away, bleed off or get contaminated. Field testing was extensive and more than 13,500kg of Omega multipurpose lubricating greases and a selection of 21 ordinary greases were used to test Omega 85, Omega 33, Omega 77 and Omega 57. Primary fan bearings of cement kilns was one application where Omega 85 was tested. Heat from the burner end of the kiln was radiated to this area and was superimposed upon bearing-generated heat. The normal temperature for the bearing using ordinary grease came to as high as 121oC). With the application of Omega 85, the temperature dropped to about 79oC. Omega 85 was also tested for lubricating hot oil pumps where temperatures reached 204oC. Asphalt hot-mix plants require hot oil to be pumped into the mix. Only greases which will not melt with such high temperatures will lubricate these pumps. Omega 85 easily withstood these high temperatures. The bearings of ten fans used in an annealing oven of a large steel mill were lubricated with ordinary grease while 10 fans were lubricated with Omega 85 multipurpose grease. Normal working temperature of these bearings was about 115oC. After three months' operation, six fans lubricated with ordinary grease broke down while those lubricated with Omega 85 continued working for another two years. Many industries produce under conditions of both high heat and high humidity. Either of these factors individually can cause grease to deteriorate. When combined, ordinary greases cannot provide lubrication for any reasonable period of time. In canning factories, where aseptic conditions are vitally important, superheated steam is used to sterilize and evacuate containers, all in one operation. Temperatures up to 260oC are encountered and in cooler locations, moisture from condensation is formed. Omega 33 was tested in such environments and demonstrated its ability to handle the lubrication of this equipment. In the lumber industry, steam is introduced into the hot air steam that is used to dry lumber in a kiln. The steam helps control the rate of drying. The centre fan bearing of this equipment encounters both the heat and the moisture. Omega 33 multipurpose lubricant was tested in this application and adhered tenaciously to the bearings and provided the required lubrication despite the severe and hostile operating conditions. In the same industry, the high-speed bearings in the band saw head rig operate at temperatures above the boiling point of water. At the same time, the lower bearings are continuously subjected to the washing action of water used to cool the saw blade. Another Omega multipurpose grease - Omega 77 - was used to improve the performance of the saw band. Water contamination of lubricants is a constant source of anxiety for lubrication engineers in almost every industry. Water interferes with the lubrication process as well as permitting the corrosion of moving joints. Water can enter bearings when seals are inadequate or in poor condition and/or when grease does not adhere to the journal to form a sealing collar. In a beer-canning operation, hot water is usually used to wash down the equipment under high pressure. The purpose is cleanliness, but the effect on ordinary greases is the tendency to wash it off the applied part. Water washing together with contamination with beer, a limited lubrication reservoir, and, in certain cases, close tolerances, provide a severe test of any lubricant. Omega 77 withstood all these difficult operating conditions and provided better lubrication. Some industries such as sawmills require bearings to operate submerged. Although designed so that the bearings would be totally enclosed, this was rarely the case. The grease is expected to provide the seal against water washing and admixture in the water. The extremely water resistant Omega 95 was able to lubricate under such conditions when other greases could not. Another successful service test application was using Omega 57 to lubricate wheel bearings of mine cars which worked extensively in water along stretches of many miles of underground tracks. Newspaper printing presses turn out a minimum of 28,000 copies per hour and the bearings undergo a high degree of shearing. In steel mills, large grease dispensing systems plus high temperatures and high risk of water contamination is encountered. 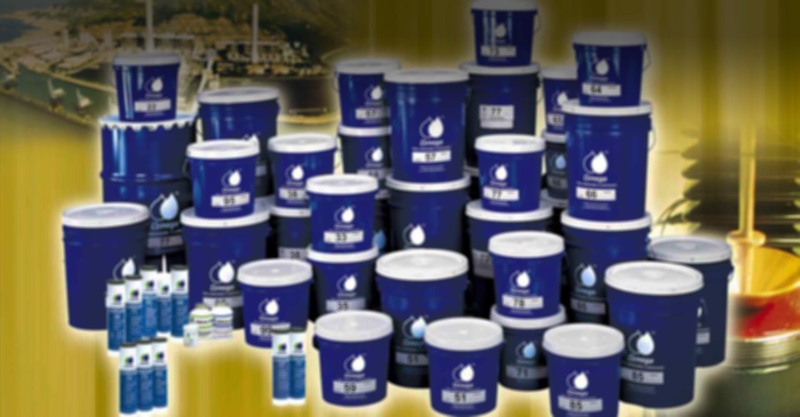 Omega 77 multi-purpose grease handled these harsh working environments without difficulty. Omega multipurpose greases were found additionally to provide excellent seals and protect bearings from corrosion and contamination. Omega lubricants also feature excellent work stability, making high machine loads at high speeds tolerable. Health problems arising from contact with lubricants are relatively infrequent and occur chiefly in circumstances where there is a considerable degree of prolonged contact. Naturally, however, as with all types of chemicals, certain extremely sensitive people tend to be hyper-allergenic to some lubricants or lubricant constituents. Similar everyday occurrences would include the developing of rashes in some people after eating strawberries or tomatoes while the large majority enjoy these foods regularly with no ill-effects. Various forms of skin irritation and even more serious conditions such as skin cancers have been associated with lightly refined petroleum products such as soot, shale oils and coal tars. Lubricants containing lead soaps constitute a special hazard since, in this form, lead can be absorbed into the skin (Omega lubricants contain no lead). In industries where prolonged contact with lubricants and fine oil sprays or mists are encountered, good shop practices can practically eliminate any operator health problems. (1) Splashguards, ventilation ducts, etc. Operators should be encouraged to maintain all passive safety devices properly to ensure minimal long-term exposure to lubricants. Where continual and direct contact with lubricants are unavoidable, clean (and regularly dry-cleaned) overalls, impermeable aprons and gloves should be encouraged to be worn. Proper wash-up facilities should be provided, including non-solvent type degreasing soaps and lotions. Workers should have quick access to first aid facilities and medical advice for emergencies. Although lubricating oils and greases do not ignite as easily as most people believe, given careless handling (sparks, cigarette smoking, improper clean-up or refuse disposal, poor machinery maintenance leading to overheating), they will catch fire as easily as wood or paper. In the interests of safety, proper fire fighting equipment and apparatus should be kept in good working order and in easily accessible areas. Advice can be sought from your local fire prevention bureau or department. Where spillage or leakage is unavoidable or commonly encountered, an appropriate oil absorbent material with especially high absorbency capabilities is recommended to be used as either preventative or eliminator. Oils and greases should be properly discarded and not poured directly into drainage systems as this may seriously damage the environment. Lubricants should only be disposed of in a safe and proper way. Consult your local environmental agency for disposal laws as they apply in your state (or country). Lubricants should never be discarded haphazardly and without thought of the sometimes irreversible damage they can cause. To the best of our knowledge, there is no safer range of lubricants available anywhere in the world than those available from the Omega Manufacturing Division. To avoid an accident, it pays to self-examine your intake of the 2Ds, drugs and drink. Many accidents leave police and accident investigation teams baffled. There is no apparent cause. The hidden cause can be alcohol, speeding, fatigue or perhaps drugs. Drug-induced drowsiness and delayed reaction time are killers. Prescription drugs, over-the-counter drugs, illicit drugs, alcohol and sometimes pill-popping can endanger your life. In cold weather, flu and runny noses act like signals to reach for drugs. The best solution is to stay in bed or see your doctor. Many 'so-called' cold fighting medicines and antihistamines can make you drowsy. COUGH & COLD REMEDIES: those that contain antihistamines, codeine or are made from alcohol, can cause drowsiness. PAINKILLERS: Some side effects include dizziness, drowsiness, impaired vision, tremors and uncoordinated muscle movement. ULCER DRUGS: Drowsiness and blurred vision. DIET PILLS: Dizziness and drowsiness. AMPHETAMINES: Sudden and total collapse. ANTI HYPER-TENSION: Amnesia-like spells, inability to concentrate, dizziness, vertigo and lightheadedness. ALCOHOL: Drowsiness, impaired vision and slow reflexes. NEVER wash down any drug with an alcoholic beverage. The combination of pills and alcohol can cause dangerously enhanced side effects and sometimes prove fatal. 1. Listen carefully to your doctor's instructions concerning the use of the drug prescribed. If he cautions against driving - don't drive. 2. Ask about possible side-effects of a non-prescription drug from the pharmacist or read the warning label carefully. 3. Avoid alcohol if you intend to drive and never mix alcohol and drugs. 4. Watch for drowsiness. Stop in a safe place and sleep off any side effects rather than take a chance you'll not arrive at your destination.